Tell him to stop using your skincare products and to get his own. Better yet, suprise him with H.I.M-istry. This brand new line was developed by licensed esthetician, Darnell Henderson, for men of all ethnicities and skin types. It even addresses common problems such as ingrown facial hair, skin discolorations, acne, and aging skin. 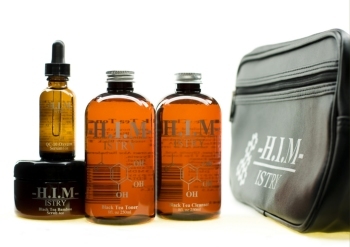 H.I.M-istry includes product lines for combination, oily, and dry skin. The oily skincare system incorporates blackberries to rid the skin of impurites and dark spots, while black tea is the leading ingredient for the combination and dry skincare systems. Known for its balancing properties, it is perfect for men with combination skin, and the natural antioxidant properties of black tea is ideal for dry skin. Visit Himistry.com to purchase products or for more information.